Abstract. The feasibility of differential absorption radar (DAR) for the spaceborne remote profiling of water vapor within the cloudy boundary layer is assessed by applying a radar instrument simulator to large eddy simulations (LES). Frequencies near the 183 GHz water vapor absorption line attenuate too strongly to penetrate the large vapor concentrations that are ubiquitous in the boundary layer. However it is shown that lower frequencies between 140 and 170 GHz in the water vapor absorption continuum and on the wings of the absorption line, which are attenuated less efficiently than those near the line center, still have sufficient spectral variation of gaseous attenuation to perform sounding. The high resolution LES allow for assessment of the potential uncertainty in the method due to natural variability in thermodynamic and dynamic variables on scales smaller than the instrument field of view. The (160, 170) GHz frequency pair is suggested to best maximize signal for vapor profiling while minimizing noise due to undesired spectral variation in the target extinction properties. Precision in the derived water vapor is quantified as a function of the range resolution and the instrument precision. Assuming an observational spatial scale of 500 m vertical and 750 m full width at half maximum (FWHM) horizontal, measurement precision better that 1 g m−3 is achievable for stratocumulus scenes and 3 g m−3 for cumulus scenes given precision in radar reflectivity of 0.16 dBZ. 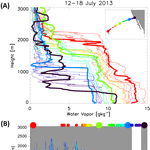 Expected precision in the column water vapor (CWV) is achievable between 0.5 and 2 kg m−2 on these same spatial scales. Sampling efficiency is quantified as a function of radar sensitivity. Mean biases in CWV due to natural variability in the target extinction properties do not exceed 0.25 kg m−2. Potential biases due to uncertainty in the temperature and pressure profile are negligible relative to those resulting from natural variability. Assuming a −35 dBZ minimum detectable signal, 40 %(21.9 %) of stratocumulus(cumulus) atmospheric boundary layer range bins would be sampled. Simulated surface reflectivities are always greater than −5 dBZ, which implies the DAR technique could provide near spatially continuous observation of the CWV in subtropical boundary layers at a spatial resolution better than 1 km. 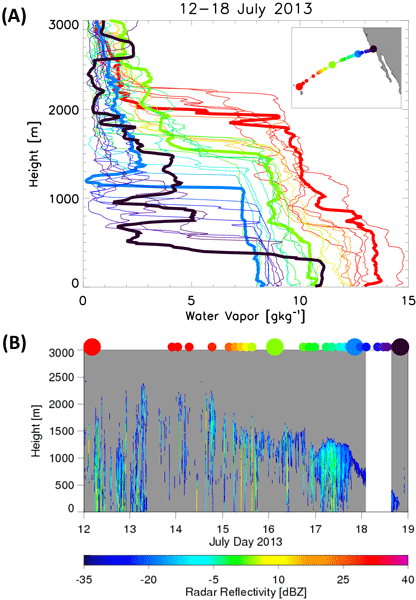 How to cite: Lebsock, M. D., Suzuki, K., Millán, L. F., and Kalmus, P. M.: The feasibility of water vapor sounding of the cloudy boundary layer using a differential absorption radar technique, Atmos. Meas. Tech., 8, 3631-3645, https://doi.org/10.5194/amt-8-3631-2015, 2015. This paper describes the feasibility of using a differential absorption radar technique for the remote sensing of water vapor within clouds near the Earth surface from a spaceborne platform. The proposed methodology is shown to be theoretically achievable and complimentary to existing water vapor remote sensing methods.